One of the biggest panels at San Diego Comic-Con this year was Warner Bros. massive Hall H presentation. Warner Bros. has always been a big time studio, but with the DC Extended Universe in their hands, they are one of the biggest games in town now. At the beginning of their presentation this year, they quietly announced their entire upcoming DCEU movie slate by revealing new logos for a bunch of titles. And then they didn't say another word about it for the entire presentation. The DCEU titles that were revealed at the San Diego Comic-Con presentation were a mixed bag of sure things and long-rumored projects, as well as a couple of huge surprises. The movies shown were Shazam, Suicide Squad 2, The Batman, Justice League Dark, Wonder Woman 2, Green Lantern Corps., Batgirl and Flashpoint, which now appears to be the title of the troubled Flash solo movie. Troubled no longer, as that particular reveal seems to have fans buzzing the most. Considering it is a beloved comic book storyline and one that has massive, universe shattering implications for the rest of the DCEU, that isn't surprising. 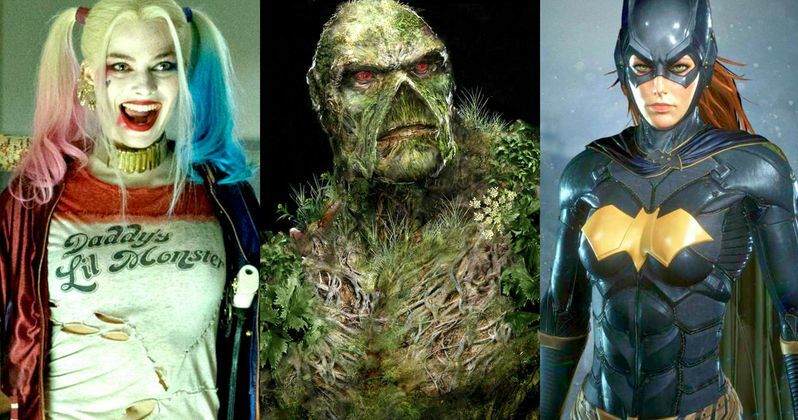 In terms of titles that weren't at all surprising, Suicide Squad 2, Green Lantern Corps., Batgirl and Justice League Dark have all been known to be in development, so no big surprises there. Though, Justice League Dark did lose director Doug Liman recently, so all of these projects, save for Batgirl which has Joss Whedon attached, still need directors. Shazam also isn't much of a surprise, but that project has been in development for a very long time, so this is good to see. It is confirmed that the movie will go into production early next year under the direction of David. F Sandberg (Lights Out), who has been long rumored to be directing the movie. The Batman and Wonder Woman 2 also don't come as big surprises, but there are some reasons the confirmation is important. For one, The Batman hasn't necessarily been confirmed as the official title in a capacity like this, so that matters. Matt Reeves is getting to work on that now and, hopefully, we will get to see it sooner rather than later. Geoff Johns and Patty Jenkins, who still isn't confirmed to be returning to direct, have already been working on Wonder Woman 2, but the project hadn't been announced yet. At least not in an official capacity. So that is a big deal, considering how big of a hit the movie wound up being. Without question, Flashpoint is the biggest reveal here. The Flash movie has been through several directors and recently had to undergo a page-one rewrite. But that all may have been worth it considering how excited this seems to have fans. We still don't have a release date for it, but it does sort of give Warner Bros. the option to hit the reset button to some degree, which is what Flashpoint did in the DC Comics universe. The storyline was a way for them to launch the New 52 initiative. Will this be how they get Ben Affleck's Batman to "gracefully" say goodbye to the DCEU? There aren't a lot of titles here we haven't heard about, but this does do a lot in firming up Warner Bros. future plans and gives us some idea of a direction that they are heading in. We did recently hear they are developing a Harley Quinn Vs. The Joker movie, which isn't mentioned here. The other curiously missing project is Gotham City Sirens, which was rumored to be on the fast track when it was announced. Man of Steel 2 and Justice League 2 are also notably absent. We'll have to see how that shakes out, but this gives DC fans a lot to look forward to in the future.